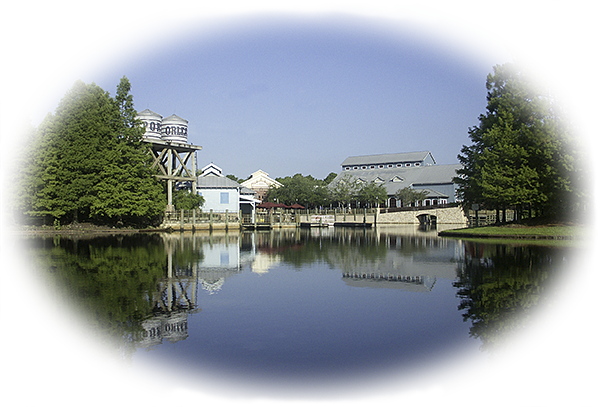 When you first arrive at Port Orleans Riverside you’ll find yourself pulling up outside the welcoming Sassagoula Steamboat Company main building. The Bell Services desk is just to the left of the main entrance doors so can can leave your bags there for later delivery right to your room if you’d prefer not to have to carry them any further. Entering the lobby, you are about to commence your Sassagoula river voyage and the checkin area to your right is themed as the departure hall for a old-style river steamboat, complete with massive ceiling fans and decorated with the ports of call along the mighty Mississippi River. There’s plenty of comfortable seating in this area for the weary traveller, and a special section for the kids to sit and draw or watch TV while whichever member of your party drew the short straw stands in the line to sort out the mundane paperwork. If you’d like to read a recent copy of the “Sassagoula Times”, the resort information and tips sheet that you’ll be given at check-in, please see our Document Downloads page. At the registration desk you will be assigned your room and each member of your party will be given a “Magic Band”, which acts as a room key, Disney charge card, park ticket and any dining plan credits all in one neat little rubber bracelet with an RFID tag inside it. Also in the registration hall is the Lobby Concierge desk where cast members will be able to help you with general enquiries, restaurant and recreation bookings, etc. Just past the registration hall is the Medicine Show Arcade, packed with video games and other fun for the youngsters — and the young at heart! 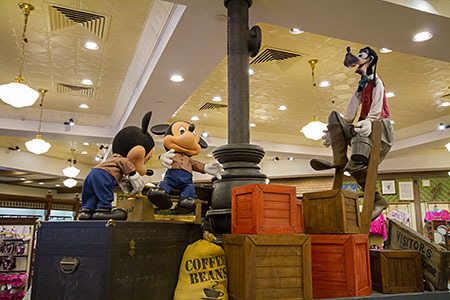 On the other side of the airy entrance lobby is Fulton’s General Store for all your Disney souvenir and vacation shopping needs, and straight ahead is a corridor leading to the resort’s bar and restaurants. 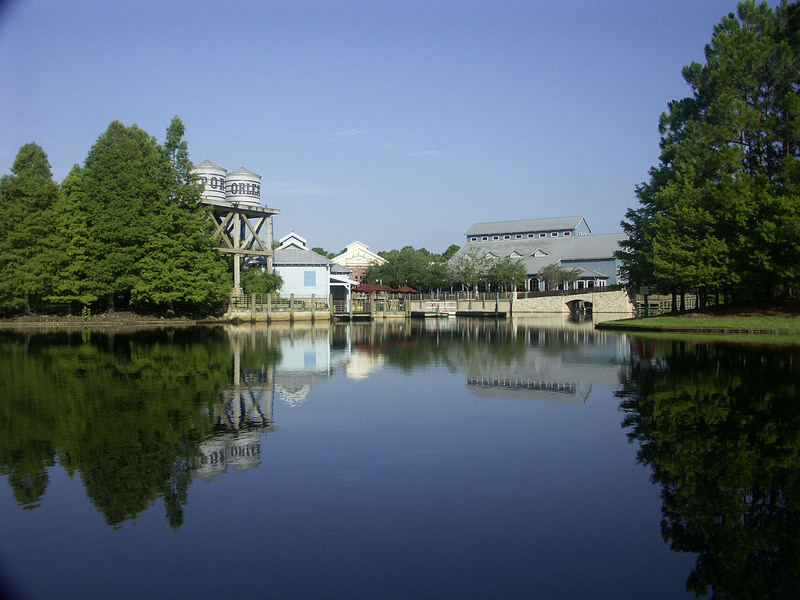 You can also walk straight through the lobby and right out onto the dockside where you can hire cycles and Surrey Bikes, catch the free water ferry to Disney Springs, or continue onward across the wooden bridge over to Ol’ Man Island. 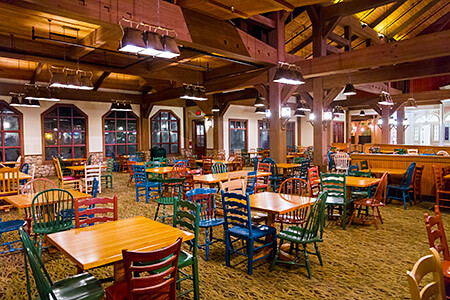 Port Orleans Riverside offers a selection of bars and restaurants for its guests and visitors to enjoy. These vary from simple drinks or a snack by the poolside to a full table service restaurant if that’s what takes your fancy. There is also a large food court with a selection of different styles of food on offer, plus the hotel shop can provide packet snacks and drinks to take away. 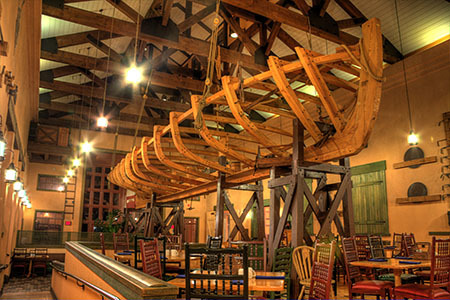 Boatwright’s Dining Hall : Port Orleans’ only table service restaurant, featuring food with a cajun flavour. Riverside Mill : Food court fayre inside a working cotton mill setting. 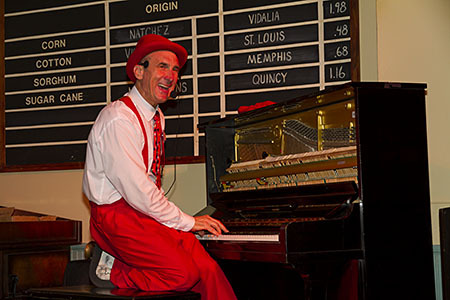 River Roost Lounge : Lounge bar within the Sassagoula Steamboat Company main building, where you will often find lively evening entertainment from “Ye Haa” Bob Jackson. 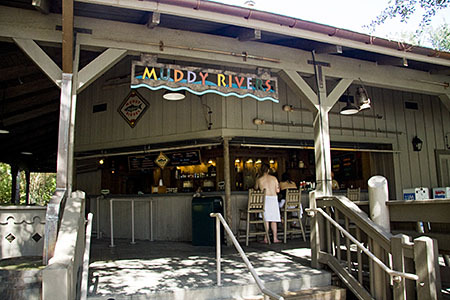 Muddy Rivers : Poolside bar located on Ol’ Man Island, right next to the resort’s feature pool. Fulton’s General Store : For all your Disney souvenir and vacation shopping needs.